Unemployed and sharing his brother’s four-bedroom house with ten children and three other adults, Ben Tuaputa needed a job, desperately. hope of a better life for his family. and his family of eight, including six children, moved into his brother’s four-bedroom home, which already housed his brother’s family of six. "It’s just wasn’t healthy," Tuaputa says. couple of months later an opportunity arose for Tuaputa to change his situation. The government program TransAction was launched at Redbank Plains State High School, and Tuaputa became one of nine community members to undertake heavy vehicle driver training. 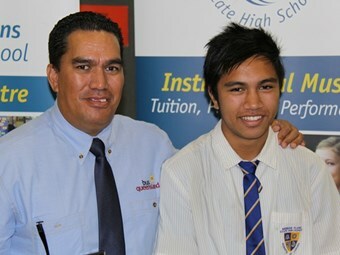 Meanwhile, a separate program, GenR8, was also launched at the school and Tuaputa’s son Alvin became one of 17 students placed in work experience at Allied Pickfords and TNT Express, while five students from Glenala State High School worked at Sims Metal. looks forward to a bus driving career with Westside Bus Co, while his son plans for a career in logistics. "Now I have my own place and I’ve been in it for three weeks thanks to this job," Tuaputa says. "I struggled, it wasn’t easy, but now I am happy and settled down and I’m looking forward to taking my career further." were presented with awards today at Redbank Plains State High School during an ceremony that attracted close to 100 people, including representatives from the transport and logistics industry and government. Transform Director Louise Perram-Fisk, who will farewell the Transform division in June next year due to a funding cut, says it was terrific to see the industry supporting community programs for two generations of people. "We are hoping that the school and the industry will have the ability to keep it rolling and we will do everything we can up to 30 June to make sure that that happens but we won’t be here to coordinate it," she says. Queensland Bus Industry Council Executive David Tape says GenR8 and TransAction have given opportunities to the local community while allowing local business to grow. "It was very humbling to listen to how grateful the guys were to have the opportunity and how it will change their lifestyle and what they can do as a family," he says.